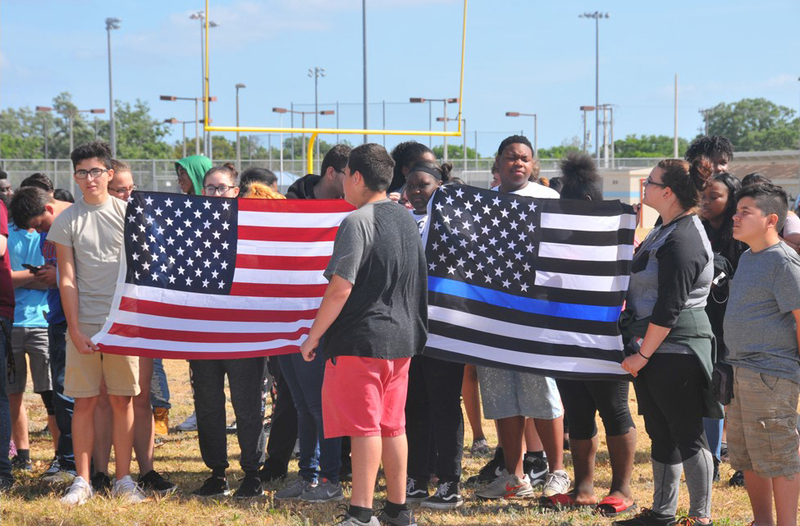 (by Caroline Glenn, Florida Today) – A group of students from Rockledge High School in Brevard County, Florida briefly walked out of class Friday to show their support for the Second Amendment. [Rockledge High School is located near the Kennedy Space Center and Cocoa Beach.]. 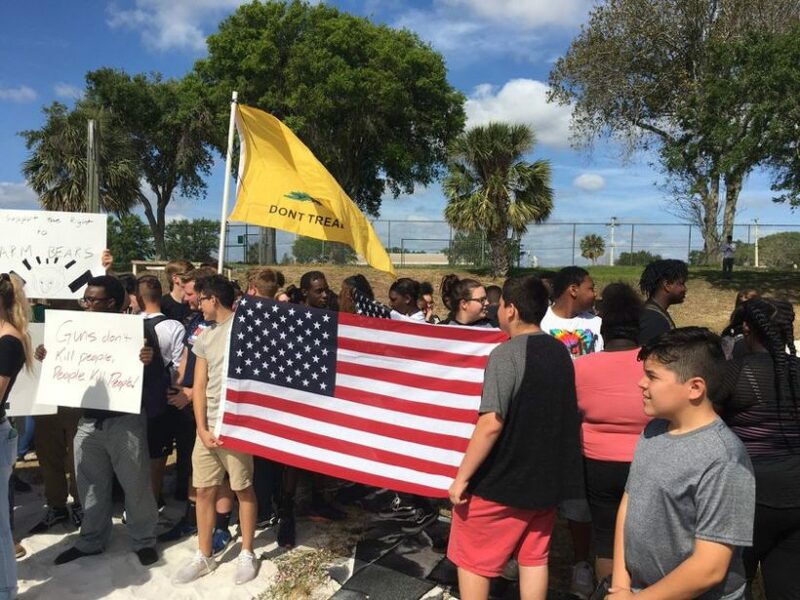 About 75 students, according to a head count by school administrators, walked onto the school’s track carrying the American flag and signs that read “guns don’t kill people, people kill people” and “I support the right to bear arms.” The event lasted about 20 minutes and then students returned to class. “I’m just saying that we should not let our rights be taken because someone else does something wrong,” said Deaton — who was wearing a T-shirt that read, “my rights don’t end where your feelings begin.” She said the event was meant to clear misconceptions about the Second Amendment, not support or oppose any particular political stances. The walkout comes after the National Student Walkout on March 14, when students from 2,800 schools across the United States walked out of class for 17 minutes to protest gun violence. 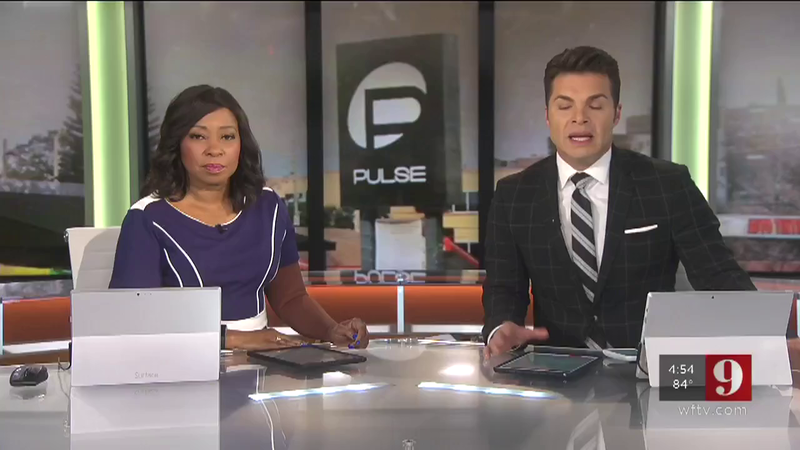 That event came one month after the shooting at Parkland’s Marjory Stone Douglas High School that left 17 dead. At least 15 schools in Brevard had walkouts on that day, including Rockledge High School, where students stood on the football field to form a heart. Deaton said it was important to make sure other students’ voices were heard. Some students who participated in Friday’s Second Amendment walkout wore…”Make America Great Again” hats. They carried “don’t tread on me” flags and black-and-blue-striped American flags that are often used to show support for law enforcement. “It’s all over the news right now that all students hate guns. I wanted to show that not all students feel that way,” said Zachary Schneider, a junior at Rockledge. …Many students who participated said they do not support a new law that raised the legal age to purchase guns, and would support a marshal program to train and arm school staff to respond during an active shooter situation. Event organizers and participants said they were disappointed the student walkouts on March 14 turned political. Deaton said the original purpose of the student walkouts was to honor the victims of the shooting, but parents and social media warped the message to support gun control. “In the beginning, it started as a memorial to the Parkland students. And that’s how it should have stayed,” Deaton said. …Emma Gonzalez and David Hogg — Marjory Stoneman Douglas students who have become the face of the movement for [gun control] — have specifically called for a ban on assault-style weapons and high-capacity magazines. Under the Marjory Stoneman Douglas High School Public Safety Act signed into law by Florida Governor Rick Scott [see “Background” below], the state provided $67 million for local sheriff’s offices to develop programs to provide training to school districts, if local school boards approve the program. Unlike many of the students who [participated in the] local March for Our Lives rally in nearby Melbourne, students at the Second Amendment Rockledge walkout on Friday said they support implementing a law enforcement plan to train and arm school staff. “If they (school staff) are capable, we should allow it. They’re just going to tell us to hide during a school shooting?” John King, a junior, said in disbelief. “I personally believe it’s a good idea, as long as they’re trained and have the knowledge,” Delaney added. Before the law was passed, Brevard County Sheriff Wayne Ivey proposed a similar program to the School Board that would train anonymous school employees who volunteer and allow them to carry a gun in a concealed holster on their hip. The School Board has not taken a stance on the proposal yet. Vickie Hickey, principal of Rockledge High School, said the school treated Friday’s event exactly like it treated the walkouts that took place March 14. She said both events were completely student-driven. From FloridaToday .com (a USA Today paper). Reprinted here for educational purposes only. May not be reproduced on other websites without permission from FloridaToday. 2. What types of signs, t-shirts and flags did the students wear/carry? 3. a) Who organized the walkout? b) How long did it last? 4. What was the purpose of the walkout? – What did some of the students who participated say about it? Be specific. 5. Approximately 75 students participated in the walkout. Considering how vocal the “March for our lives” leaders are, do you think there were other students who might have silently agreed but chose not to be identified with a viewpoint unpopular in the media? Explain your answer. 6. Students from across the country participated in “March for our lives” marches demanding gun control laws. Are you surprised to learn that students do not all hold the same point of view, and in fact have differing points of view? Explain your answer. “I finally got old enough to buy my own ammunition and my own guns, and I lost it again,” Schneider said, referring to the Marjory Stoneman Douglas High School Public Safety Act. The Safety Act, which was signed into law by Gov. Rick Scott in response to the shooting in Parkland, raised the legal age to purchase guns from a licensed dealer from 18 to 21; puts in place a three-day waiting period to purchase long rifles and other long guns; and bans the sale and possession of bump stocks, devices that make a semi-automatic weapon shoot nearly as fast as a fully automatic weapon. The law also implements regulations to keep guns out of the hands of the mentally ill. The Safety Act did not ban assault-style weapons, like the AR-15 Nikolas Cruz used to kill 14 students and three adults at Marjory Stoneman Douglas High School on Valentine’s Day, ignoring a call from some of the shooting’s survivors.